Hello friends, today I am sharing with you Christopher Lake’s very own, the deliriously delicious Yellow Fender Coffee House and Eatery! This wonderful bistro is a little gem and if you are coming to this neck of the woods, I highly recommend you stop here for some tasty nourishment. 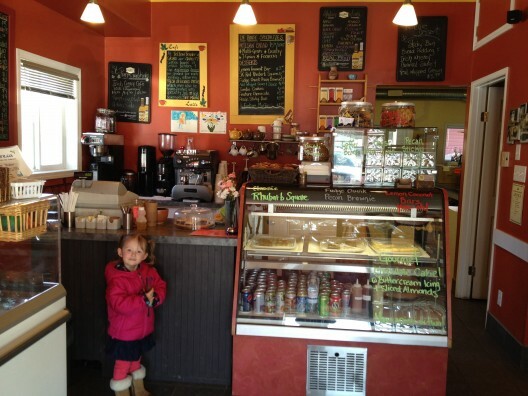 It is owned and operated by a mother Connie Freedy, who is also a Red Seal chef, and her daughter Heidi O’ Brodovich. 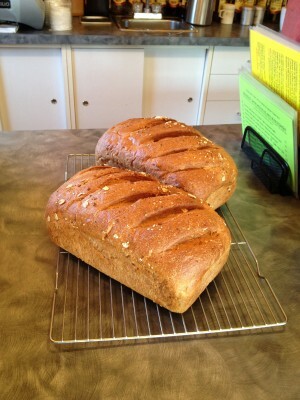 Together they lovingly prepare fresh food made from local and Saskatchewan ingredients. The restaurant it’s self is warm and inviting, with the smell of fresh baked artisan bread and gourmet coffee brewing, it’s instantly relaxing. Their creations are extensive from hearty soups, to fruit smoothies, to lentil walnut burgers and don’t worry meat lovers they also have local bison and their house burgers. You always feel good after eating there as they use the best quality ingredients. They also specialize in small event catering, so if you are planning an upcoming event, give them a shout at 982-4240 and let them work with you to develop the perfect menu! 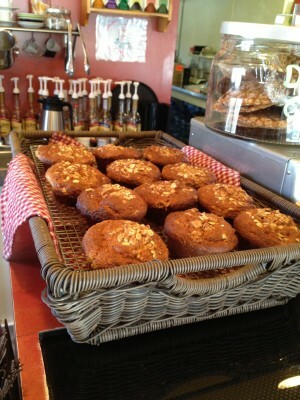 Yes I will have a muffin with my espresso! 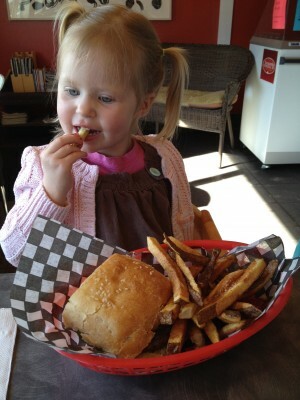 Fresh made hamburger and bun with house cut fries = awesome! Yellow Fender is open year round and hours vary depending on the time of year, just give them a shout to verify. During the summer they are open 8:00 am to 8:00 pm Tuesday – Saturday, Sunday 10:00 am – 6:00pm and closed on Mondays.